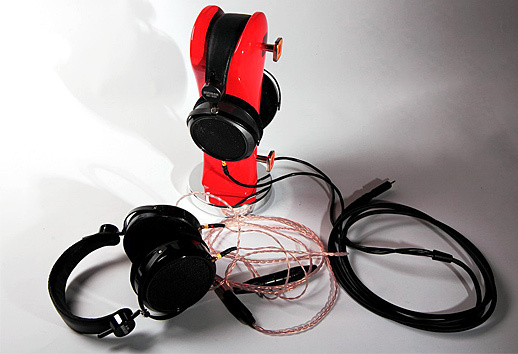 The reviewed headphones are among the most expensive models offered by the American company HiFiMAN. The HE-6 (‘HE’ in the name is the name of their designer, Mr. He, a born Chinese) is the newest addition at the top, while the HE-500 are positioned between the old “flag” model EL-5LE and the HE-6. The latter are a classic evolvement of the previous design – they have rather low impedance (among headphones only the Grado have a lower one) and, most of all, very low efficiency. This makes them very difficult to drive – they require a very powerful amplifier. Looking at the HE-500 and other headphones of this manufacturer, letting aside the different color of the metal components in the newest HE-400 and HE-300, it is hard to catch the differences between them. They are headphones with soft shells surrounding the ears. The reviewed units have their soft parts made of a soft material (velour). The headband is also the support point on the head – it is covered with leather in that place. From below each earcup we see a detachable cable. The sockets are very good – gold plated, with Teflon used as isolator. 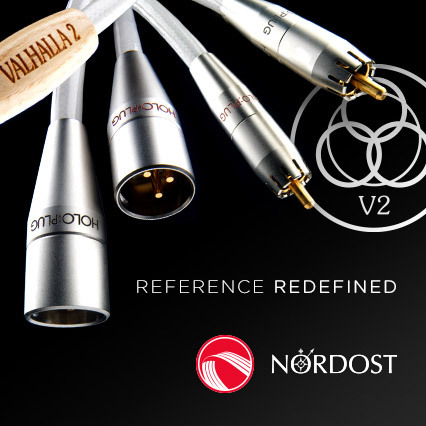 With each model we get a different cable; for the HE-6 it is balanced, with an adapter to an unbalanced 6.3mm “big jack” plug. The cable is made of high purity (single crystal) copper. The adapter is very heavy and located quite uncomfortably – the whole time I had problems placing the cable in such a way that the adapter would not pull it away. 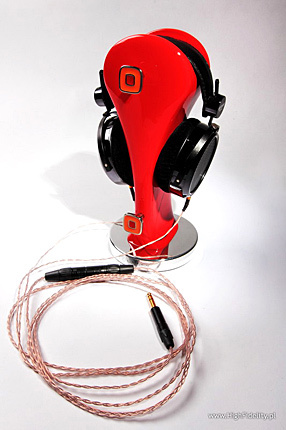 The HE-500 comes with a thick, rather cumbersome cable from the Japanese company Canare, originally designed as a speaker cable (3m length). However, in the set we get another, thinner cable, terminated with a 3.5mm mini-jack, but with four rings. It looks almost the same as a standard mini-jack, but has separated ground for the left and right channels, for Mr. Fang believes in superiority of balanced connection of the headphones. Usually, a stereo cable with a jack plug has common ground for both channels; here it is separated. Of course, you need a special amplifier, with a dedicated socket – HiFiMAN has a suitable model in their catalog – the EF-6, also an optional amplifier card to the HM-801 player, with a balanced output. In the box we also have a spare earpads and spare sockets – to be able to use any cables. 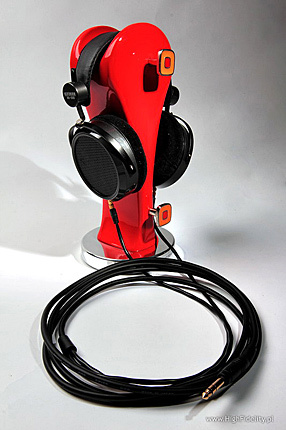 All big HiFiMAN headphones have orthodynamic design, also called planar-magnetic – they are magnetostats (similar to loudspeakers from Magnepan). Their diaphragm is made of ultra-thin Mylar foil with the voice coils sprayed on it. According to Mr. Fang, the HE-500’s coils are made of aluminum, and the HE-6’s of gold. The magnets in such constructions can be placed on one side of the diaphragm or on both sides. In the HE-500 and HE-6 they are on both sides. The HE-6s are nicer on the outside – it can be seen that the company went to great lengths to make them look more luxurious: shiny metal components, nicer leather, etc. Except for this, both models look identical and come in very similar boxes. The biggest difference is their effectiveness – HE-500s have 89dB (1W/1m) and the HE-6s 83.5dB (1W/1m). The headphones fit well on the head, although they seem heavier than the HD-800 from Sennheiser. But they clamp on harder and maybe that’s why their bass seems more energetic. Audiofeels, Uncovered, Penguin Records, 5865033, CD (2009). Carol Sloane, Hush-A-Bye, Sinatra Society of Japan/Muzak, XQAM-1031, CD (2008). David Sylvian, Sleepwalkers, P-Vine Records, PVCP-8790, CD (2011). Ella Fitzgerald & Louis Armstrong, Ella and Louis, Verve/Lasting Impression Music, LIM UHD 045, UltraHD CD (2010). Eva Cassidy, Songbird, Blix Street Records/JVC, VICJ-010-0045, XRCD24 (2010). Fleetwood Mac, Rumours, Rhino, FLAC 24/96. Jean Michel Jarre, Téo&Téa, Aero Productions/Warner Bros, 2564699766, CD+DVD (2007). Metallica, Metallica , Warner Brothers Records, FLAC 24/96. Miles Davis, Tutu, Warner Brothers Records, FLAC 24/96. Pieter Nooten & Michael Brook, Sleeps With The Fishes, 4AD, GAD 710 CD, CD (1987). Pink Floyd, Wish You Were Here, Experience Edition, EMI/EMI Music Japan, TOCP-71169-90, 2 x CD (2011). Ralf Illenberger, Red Rock Journeys, Stockfisch, SFR 357.1020.2, CD (2011). The Modern Jazz Quartet, The European Concert. Volume One + Volume Two, Atlantic/East West Japan, AMCY-1186-7, K2 CD (2000). Yello, Touch, Universal Music Group, FLAC 16/44,1. Japanese versions of the discs are available from CD Japan, 24/96 versions from HDTracks. I started the listening session from the comparison of the HE-500 to my headphone system, meaning the modified amplifier from Leben and the Sennheiser HD-800 headphones. In my opinion this is a killer combination. Many times I cannot wait to sit down in the evening, with a book in my hand and headphones on my head to listen to something new, or something I know very well. It is not easy to compete with such a duo, and to date nothing came even close, including my beloved and valued AKG K701 headphones. The only breach in this wall was the system from STAX. But only in a few aspects. And if I had to choose, I would take my own system without a hesitation. Placed in such a hostile environment (mentally, not electrically…) the HiFiMAN headphones showed what the Sennheisers are lacking, presenting a slightly different, alternative world (I mean, they made me realize its existence), but also paid a tribute to the HD-800. Let’s start with the things that Fang Bian’s headphones do better. The HE-500s sound less “clumped”. I do not know how to describe it differently, but probably do not need to – this description is quite fitting for the impression we have going from the HE-500 to the HD-800. It is a little bit different the other way round, but that’s not the point. The American (although manufactured in China) headphones can put things together better, glue things together from loose elements. In contrast to “clumping”, “gluing together” is here a purposeful process, having greater good as its goal, while “clumping” is something chaotic and pointless. Due to all this, the sound of these headphones is very coherent. The Sennheisers seem sloppier in comparison. And there must be something to it, for although after long listening sessions, after accommodation of the ears we have to modify this opinion a little (based on the same premises! ), yet this first impression brings valuable information. We can also immediately hear that the tonal balance of the HE-500 is completely different. Their midrange is clearer, much more open. This is especially well audible with vocals – either listening to Ego:X by Diary of Dreams or to the duo Fitzgerald and Armstrong, the impression of their presence, here and now, was much more unanimous. Interestingly, with instruments that should profit from that, such as the vibraphone on The European Concert. Volume One + Volume Two by The Modern Jazz Quartet, or the acoustic guitar of Ralf Illenberger, the Sennheisers had an advantage, giving both instruments more energy, better defining their body. Why it was that way – I do not know. Maybe it was a reflection of matching the headphones with the given amplifier. The bass reaches similarly low in both headphones, although the HE-500s show it in a more coherent way, clearer reproducing the moment of energetic sustain (because they are not sharp, so the attack is not accented). However, the Sennheisers fill it with content, in the sense that the flow of the melodic line is better with them. A similar thing happens to the treble. The HiFiMAN headphones seem a bit closed at the top, not bright enough. Against such background, the HD-800s seem much more open, better differentiating the upper treble components. In general, these are two completely different pair of headphones. The HE-500s play the midrange and upper midrange stronger, also the bass, while the treble is softer. Putting them on our heads we go somewhere else – the sound is very energetic and exciting. However, since this happens every time, the emotional tension is not differentiated between recordings.